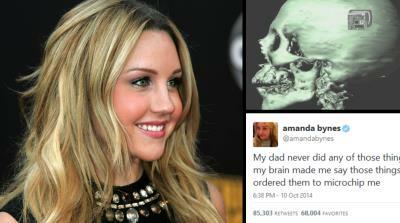 LOS ANGELES — Amanda Bynes’ claim that a microchip implanted in her brain made her tweet bad things about her father could be key evidence in keeping the actress in a mental facility, according to experts. Her admission to Las Encinas Hospital came hours after Bynes posted a series of tweets alleging her father verbally, physically and sexually abused her. Bynes then boarded a flight from New York to Los Angeles, where she told reporters at the airport that she was there to file a lawsuit against her parents. While she was told that a limo driver was taking her to a lawyer’s office in Pasadena before going to a West Hollywood hotel, she was instead driven to the hospital — which resembles an office park — where her parents’ lawyer was waiting for her. “In a perfect world, one would be honest about getting a person into a psychiatric hospital, but from her past behavior we have seen that Amanda Bynes avoids psychiatric hospitals at all cost because she doesn't believe that she’s sick,” Dr. Carole Lieberman, a Los Angeles psychiatrist who has followed Bynes’ story, told CNN on Sunday. If the psychiatrists at Las Encinas Hospital decide to extend Bynes’ involuntary treatment beyond the initial 72 hours allowed for evaluation under California’s “5150” law, they must convince a mental health referee that she is “a danger to self, to others or is gravely disabled,” Lieberman said. There does not have to be any expressed desire to kill herself, but the doctors need to show evidence that her behavior was so dangerous that it “presented a risk to herself, if not others,” Lieberman said. One reason for keeping psychiatric patients on an involuntary hold is if they are “having auditory hallucinations” or they are “responding to internal stimuli,” according to guidelines on the Los Angeles County Superior Court website. Her tweet about a microchip forcing her to write negative things about her father would not be the only potential evidence, based on her very public history of odd behavior and several criminal charges. Her last several days in New York included an incident at a clothing store in which security officers accused her of shoplifting. She was let go after signing a “no-trespass agreement,” TMZ reported. This is the second time Bynes has been placed under an involuntary psychiatric hold. The previous instance came in July 2013 after she was “involved in a disturbance in a residential neighborhood” in Thousand Oaks, California. She eventually entered an inpatient psychiatric facility and was later released into her parents’ custody. Bynes’ parents will not be allowed to attend the administrative hearing, which would be held at the hospital, unless their daughter invites them, according to court guidelines. They have not publicly indicated if they will ask a judge to give them legal control of their daughter under a conservatorship.